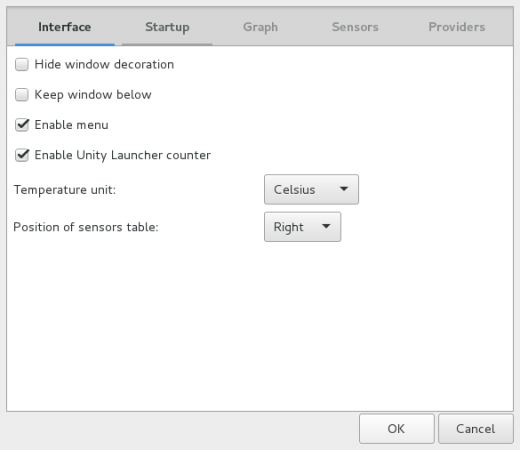 Psensor is a GTK+ (Widget Toolkit for creating Graphical User Interface) based application software. It is one the simplest application to monitor hardware temperature and plot Real Time graph from the obtained data for quick review. Show Temperature of motherboard, CPU, GPU (Nvidia), Hard Disk Drives. Psensor is capable of showing remote server Temperature and Fan Speed. Show CPU usages, as well. Infact Psensor will detect any supported Hardware and report the Temperature as text and over graph, automatically. All the temperatures are plotted in one graph. 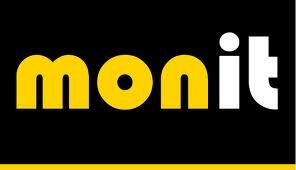 Alarms and Alerts ensures you don’t miss a critical System Hardware Temperature and Fan Speed related issues. Easy to Configure. Easy to use. lm-sensor and hddtemp: : Psensor depends upon these two packages to get the reports about temperature and fan speed. psensor-server : It is an optional package, which is required if you want to gather information about Remote Server Temperature and Fan Speed. 1. As I said above that Psensor program depends on lm-sensor and hddtemp package and these two packages must installed on the system in order to install Psensor. Both these two packages are available in the official repository of most of the standard Linux distributions, but in RedHat/CentOS based systems, you need to install and enable epel-release repository to get these packages. Note: If you are using Fedora 22, replace yum with dnf in above command. 2. Once these two dependencies installed on the system, you can install Psensor on Debian alike systems using following commands. Unfortunately, on RedHat alike systems, Psensor isn’t available from the default system repository, and you need to compile it from source as shown below. Next, download the most recent stable Psensor (i.e version 1.1.3) source tarball and compile it using following commands. 3. 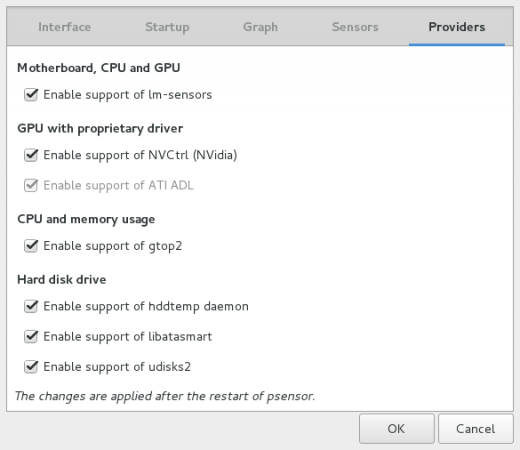 Install Psensor Server – optional. It is required only if you want to see the temperature and fan speed of remote server. Note: That the Psensor Server package is only available under Debian alike systems, there isn’t any binary or source packages available for RedHat systems. 4. It is optional but suggestive step you should follow. Run sensors-detect, as root to diagnose the hardware’s by sensors. Every Time Type the default option ‘Yes’, until you know what you are doing. 5. Again Optional but suggestive setup you should follow. Run sensors, as root to display the temperature of various Hardware Devices. All these Data will be used for Psensor. 6. 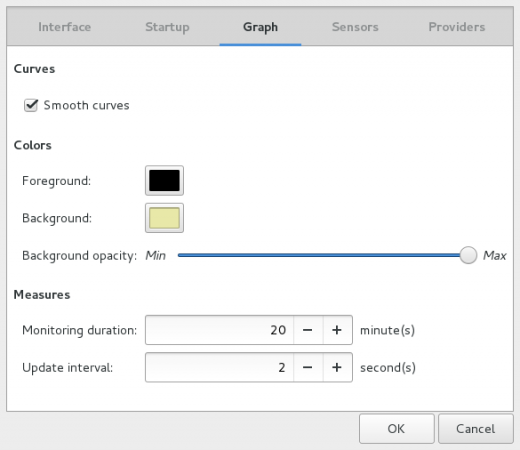 Run Psensor, from the desktop Application Menu to get the graphical view. Check mark all the Sensors to plot graph. You may notice the color codes. 7. Go to Menu Psensor → Preferences → Interface. From here, you can have options for Interface related customization, Temperature Unit and Sensor table Position. 8. 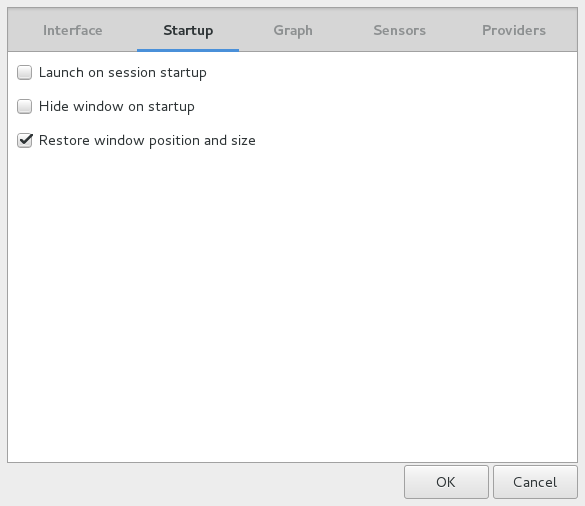 Under Menu Psensor → Preferences → Startup. 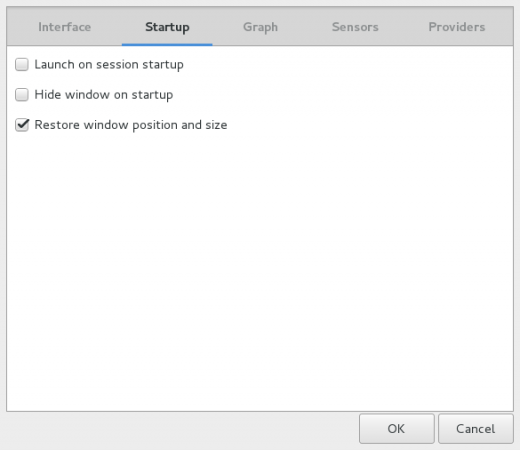 From here, you can configure Launch/Hide at Startup and Restore Window Position and Size. 9. Under the Hood Graph (Psensor → Preferences → Graph), you may configure Foreground/Background Color, Monitoring Duration, Update Interval, etc. 10. 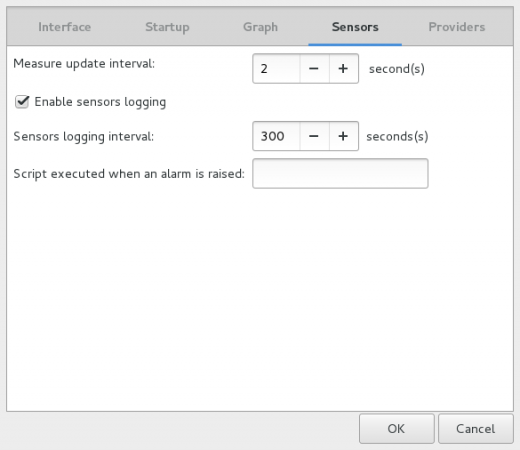 You may configure Sensors Settings under (Psensor → Preferences → Sensors). 11. 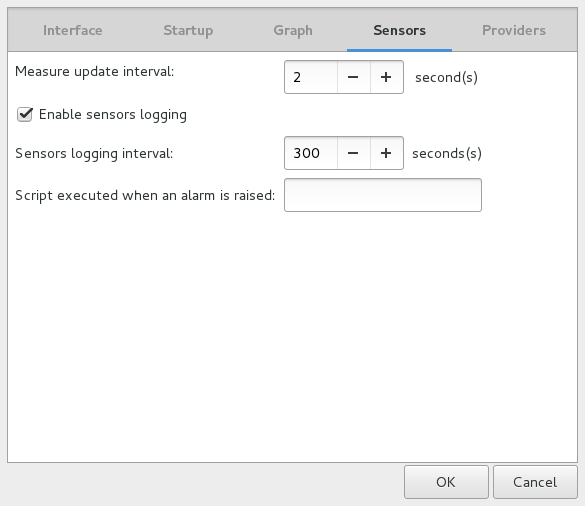 The last tab (Psensor → Preferences → Providers) provides you with Enable/Disable configuration for all the sensors. You may do sensor Preferences under (Psensor → Sensor Preferences). Psensor is a very useful tool which lets you see those gray areas of system monitoring which is often overlooked upon i.e., Hardware temperature monitoring. A over heating Hardware may damage that particular hardware, other hardware in the surrounding or may crash the whole system. No, I am not thinking from financial perspective. Think of the value of Data that might loose and the cost and time it will take to build the system again. Hence it is always a good idea to have a tool like Psensor beside ourselves to avoid any such risk. Installation on Debian alike system is pretty simple. For CentOS and alike System, installation is a bit tricky. I’m really struggling with this. Linux newbie, wanting to troubleshoot unexplained shutdowns. Running Debian GNU/Linux 9 (stretch) 64-bit. Could find no clues in log files, so I figured monitoring CPU temp might help. Why you compiling? when you can easily install using package manager as shown. I love psensor and use it on all of my computers, especially my 5 laptops. I would like to use the shutdown feature script but I havent been able to get it to work. If anyone has a script/template that I can use on my Linux machines, I’d be very grateful. I also need to know where the sensor log files are located and if I can move them to another location so that other Administrators can have access to them? Hi, How accurate are Psensor’s readings? Install latest version C headers for the standard library.. Thank you for the nice article. Is it possible to display an alert and shutdown the system when the temperature goes beyond certain predefined level? hope i can mark and install with this version also. saw the alert facility, no idea about optimal threshold temperature in terms of value for various cores, cpu usage, free memory, hdd. thanks. superb instructions. make it easy even for a centos user. Very nice article that I used on my F23. However, please add a missing package in Step 2 for Fedora/Redhat/CentOS to include “yum install lm_sensors-devel” as the make command was complaining about a missing header file. Thanks for finding this article useful and also thanks for point out that missing dependency about lm_sensors-devel package, as per your suggestion, we’ve updated the article..